Betsy DeVos, the U.S. Secretary of Education, weathered a volley of questions this week about a Bloomington, Indiana private school that receives state-funded vouchers but reserves the right to deny admission or discontinue enrollment to students from lesbian, gay, bisexual or transgender families. Bloomington’s Lighthouse Christian Academy was held up as an example of a private school that receives tax dollars but reserves the right to discriminate against students, as federal lawmakers questioned DeVos over a budget that plans to spend $1 billion on a federal school choice agenda. DeVos refused to say whether her office would withhold funds from private schools that discriminate against students. It’s the latest development in the national dialogue over school vouchers, which allow families to receive tax dollars to pay for private school, and which the Trump administration has targeted as its educational priority. Attorney Brian Bailey, Lighthouse Christian Academy spokesperson, defends the school’s admission policy. Bailey was former Gov. Mike Pence’s state budget director. Lighthouse Christian Academy was featured in our recent collaboration with NPR that investigated Indiana’s voucher program. In its online admissions policy, the Bloomington school includes LGBTQ identities under “behaviors prohibited in the Bible.” It continues to say that, “in situations in which the home life violates these standards” the school reserves the right to refuse admission or discontinue a student’s enrollment. Lighthouse received $665,400 in taxpayer-funded voucher dollars this year. When federal legislators questioned whether DeVos would “stand up” for LGBTQ students seeking to attend a school, DeVos testified she’d defer to states and parents on the matter. “For states who have programs that allow parents to make choices, they set up the rules,” DeVos said. Indiana’s voucher system, the Choice Scholarship Program, has garnered increased attention in the national dialogue in recent months. The program, which gives parents state tax dollars to pay for private school, is the largest such program in the country. The $146 million program pays for over 34,000 students to enroll in private schools. Indiana law prohibits the state from regulating curriculum content and religious instruction or activities at voucher-accepting schools. 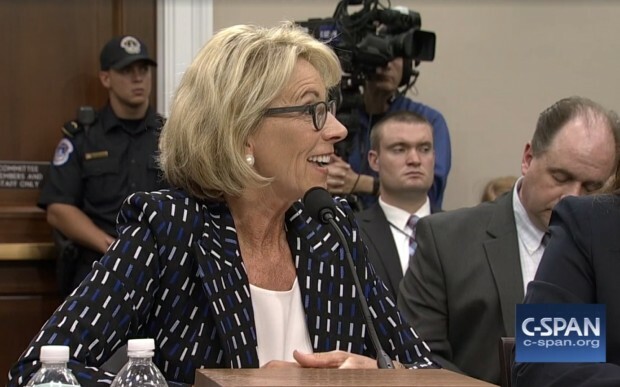 Earlier this week, DeVos was in the state to praise Indiana’s voucher program. She visited a high-performing Indianapolis Catholic school that accepts voucher students. Like many voucher-accepting schools, it enrolls far fewer students with special education needs than the districts it draws from. About 17 percent of Indianapolis public school students have special education needs. Providence Cristo Rey does not teach a single student with special education needs this year.